SAN FRANCISCO, CA – The San Francisco Opera’s production of DON CARLO. could only be summed up in a single adjective: Magnificent. Visually, we delighted watching the opulent costumes and sumptuous sets. From the first notes of the “Entrance Aria”, the the tragic love story captured our imagination. And through the night, the “French-School” majestic harmonies played by the orchestra, under the baton of NICOLA LUISOTTI, interwoven with the sterling voices of a selected set of singers, lifted our spirit. Around de year l866, Italian composer GIUSEPPI VERDI, was challenged to produce in Paris, a French Grand Opera in the Meyerbeer’s style of composition. To meet the challenge, with French FRANÇOIS JOSEPH MÈRY and CAMILLE DU LOCLE as librettists, and based on a play by German’s poet FRIEDRICH SCHILLER, he composed DON CARLO. In five acts, the longest of all his operas. Because the opera had been commissioned as a show-piece for the Paris Opera, it needed “Grandeur,” embellished sets, opulent costumes and many singers. According to VERDI, DON CARLO met all the requirements. Instead of in the individual arias, for this opera, VERDI put the emphasis in the singing in the choirs and wrote masterful harmonies for each one: For the woman’s choir of the ladies of the court, For the men’s choir of the people of Flanders, for the choir of the priests of the inquisition, and for each of the voice-mixed choirs of the town’s people. And because the plot demanded many mood changes, he composed somber music for the wind instruments played with rhythmic drums for the somber moments, and light music played in the violins and flutes for the joyful. His individual arias, however, for a work of this size, are few. The Libretto of DON CARLO was based on Nouvelle Historique (A novel) written in l673, by de Abbé de SAINT REAL, The monk based his “Historic Novel” on the unsubstantiated rumors that El infant Don Carlos, (The character’s name in Spanish) the heir to the Spanish throne, was secretly in love with princess Elisabetta Du Valois, who was the daughter of Henri II of France, and the third wife of his father’s King Philip II of Spain, The drama in the story being that because Don Carlos and Elisabetta had been betrothed to each other as children, they were in love with each other. German Poet FRIEDRICH SCHILLER had written a play based on the monk's story and VERDI liked the plot. We have to remember, however, that because SCHILLER, had spent his adolescence under the rule of Duke KARL EUGEN of Württemberg, as a youngster, he had experienced the effects of the abusive powers by the nobility on other people and in person, so he often used “abuse” as a theme in many of his plays. DON CARLO, was no exception. The “abuser” here is King Phillip II, the King of Spain who in the plot of the play, abuses his young wife Elisabetta, and destroys Don Carlo, his only son. Because VERDI was aware that the story of Don Carlo was not historical, when he based the libretto of DON CARLO in SCHILLER’s play, to set the record straight between fiction and faction in l883, after DON CARLO had been a success, he wrote in one of his letters to GIULIO RICORDI, his publisher, that the only reason why he had based DON CARLO on Schiller's play, was because the play was dramatic, but that there was no truth in it and that the only thing that was historical in the work, were the characters names. DON CARLO debuted in Paris on March 11, l867, at the Paris Opera, where it was presented during the NAPOLEON III Universal Exhibition, in France. SAN FRANCISCO’s OPERA’s production of DON CARLO was presented in five acts and sang in Italian with translation by ACHILLE de LAUZIERES and ANGELO ZANARDINI with additional text translations by PIERO FAGGIONI. On the night of June 20th, the work, directed by EMILIO SAGI was immediately established as great performance. 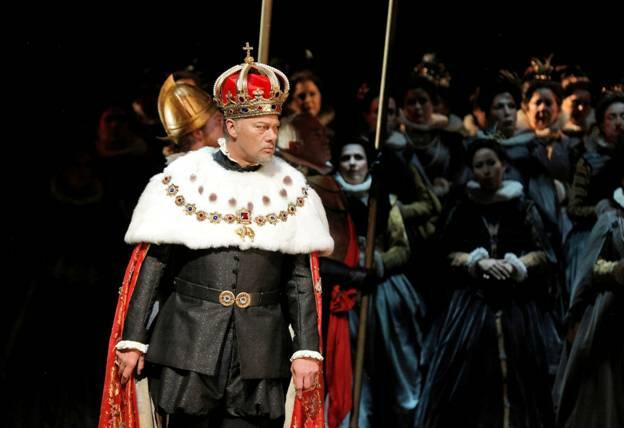 What was shown to the S. F. audience, was VERDI’s DON CARLO as its best. The interpretation of the music on the part of the different instruments of the orchestra, was tuneful and able to convey the pathos of the drama. Each one of the sets, representing the rooms of the palace, the queen’s garden, the Escorial, and the elaborate gold casket of Carlos V, (Don Carlo’s grandfather) reminding people (from eternity) that only in death, we can find peace, looked as perfect as paintings. The most impressive, the one showing the procession of the courtiers, the majestic entrance of the King and Queen, the procession ot the men in white with pointed hats of the priest the Inquisition, folloed by the procession of the heretics, and ending with their burning. The tone of the voices of the principal singers was sterling in quality. 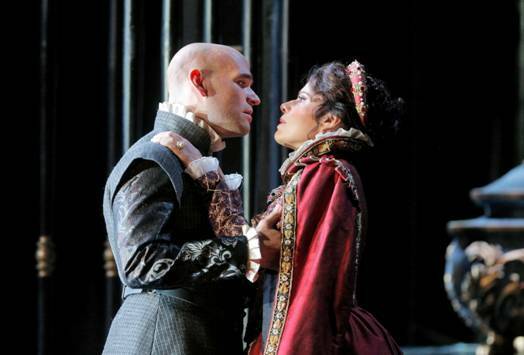 Their acting believable, the choruses capable to move us with their sound alone Singing the leads, in the Opera, were Tenor MICHAEL FABIANO and Soprano ANA MARIA MARTINEZ making their role debuts as Don Carlo and Princess Elisabetta. FABIANO, who has previously sang in Convent Garden, the Paris Opera and the Metropolitan, to name a few houses, is the recipient of the 2014 RICHARD TUCKER AWARD and the BEVERLY SILLS ARTIST AWARD is the first singer to win both in one year. Hearing his voice was easily understand his awards. His voice is full, powerful and yet soft, He sings both his high and low tones with ease and moves through the scales in a breathless beautiful sounding tone He also sings with feeling and put meaning to each one of his words. On that night’s performance, from the moment the curtain was raised and he stood alone, in the front of the stage, with a miniature version of Fontainebleau (the French Royal Palace) stretching in the back interpreting an aria in which he remembers the place he is now seeing again, as the place where he first met Princess Elisabetta, his future bride, and fell in love with her, he captivated the Audience. For Grammy Award Winning Lyric Soprano ANA MARIA MARTINEZ, her debut in the role of Elisabetta, marks her return to the San Francisco Opera where she debuted in 2003 in the role of Pamina in MOZART’s THE ZAUBERFLÖTE sang the mezzo-role of BIZET’s Carmen, in 2006 and the role of GRIMALDI’s Amelia, 2008. The Soprano is well known on the European Stages and in the stages of The Metropolitan, the Houston Grand Opera and LA Opera. The singer had recorded records and toured with Tenor ANDREA BOCELLI and TENOR PLACIDO DOMINGO singing classical music and Spanish Zarzuelas. 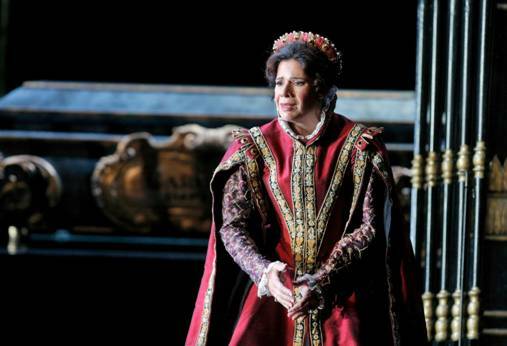 Her role in DON CARLO as Queen Elisabetta gave her a chance to display the two ranges of her exquisite voice. The high tones in her melismatic passages, where she climes the scales fast, ending is very soft, pianissimos to simulate a prayer. And in her middle-range voice, her chess tones enunciating every word to describe her pain. And in this role, her pain is intense because her marriage with Phillip II has converted her into the Queen of Spain, and step-mother, of the man she loves. Another Grammy Award singer on that night, was Bass RENÉ PAPE a Singer from Dresden and a Wagnerian singer, who debuted at the Berlin State Opera in 1988 (while still a student. He had sang at the Metropolitan Opera, and first sang at the S.F Opera in 2001 as an old Hebrew in SANSON ET DALILA and in t Die Meistersinger von Neuenburg . In this production, his deep full Bass tone, adapted marvelously to her role of Phillipe a heartless King, who does not care for his people and wonders if the Inquisition will allow him to kill his own son for treason. Yet, in another majestic Verdi’s aria, and in a completely change of mood, is able to express to Rodrigo, (his confidant) his infinite loneliness knowing that he is hated by his only son, and by the wife (Elisabetta) he loves. And to complicate the drama, in DON CARLO, there is Princess Eboli (NADIA KRASTEVA) who is secretly in love with Don Carlo, and his best friend, RODRIGO, Marquis of Posa, (MARIUSZ KWIECIEN) a friend, so loyal that is capable to die Both singers gave us masterful performances. And in this particular work we cannot forget the role of The blind and aged Grand Inquisitor (played by ANDREA SILVESTRELLI) for whom VERDI’s (basing his work in a scene from SCHILLER’s drama) wrote a magnificent duet between Philippe and the Inquisitor in which the powerful deep bass voice of SILVESTRELLI speaking of the inquisition’s punishments made people tremble. 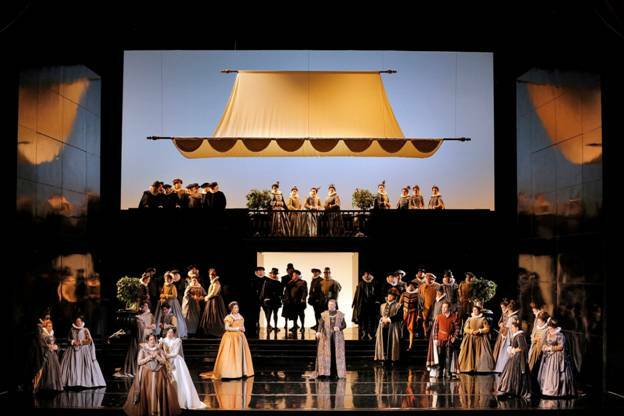 This magnificent production of DON CARLO, demonstrates that the SAN FRANCISCO OPERA productions, are equal in quality to the best Opera Productions presented around the world.